The Missile Warning Operations Center (MWOC), previously known as the Tactical Operations Room (TOR) was where the missile warning and space surveillance missions were accomplished. Above is a picture of the Data Analysis Console (DAC) where the commander and crew chief worked. The MWOC was right next door to CSMR and just above MIP. The MWOC was manned 24 hours a day by a crew of five (at one time seven or eight) Air Force and Canadian Forces personnel. A typical crew in 2000 was the Crew Commander (CMDR--a captain or lieutenant), Crew Chief (CCH--technical sergeant), Tracker Console Operator (TCO--a staff sergeant or airman), Detection Radar Operator (DRO--a staff sergeant or airman), and Space Object Identifier (SOI--a staff sergeant or airman). 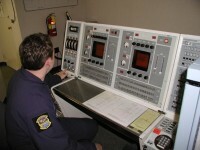 The DRO monitored the three Detection Radar Equipment Displays (DREDs), watching for interference or malfunctions. 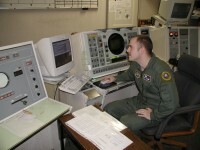 The TCO controlled the tracking radar to cover for detection radar malfunctions and performed the majority of the space track tasks on the crew. The SOI worked with the TCO to identify orbiting pieces and to identify their size and orientation. 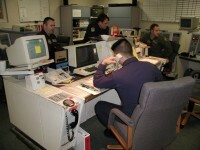 The Commander and Crew Chief managed the crew, worked with CSMR, and handled all of the communication with Higher Headquarters. The most important communication was known as Site Reporting. A crew performed site reporting whenever a Launch and Predicted Impact (L&PI) report was generated by the MIP. During site reporting, the crew worked with MIP personnel, CSMR, and the operations crew to determine whether the L&PI was valid or not. This information was then relayed to the Missile Warning Center (MWC) to aid them in making their determination on whether or not North America was under attack.